This article is about the garment. For other uses, see Jacket (disambiguation). A sports jacket, known as a "sport coat" in the U.S. The word jacket comes from the French word jaquette. The term comes from the Middle French noun jaquet, which refers to a small or lightweight tunic. In Modern French, jaquette is synonymous with jacket. Speakers of American English sometimes informally use the words jacket and coat interchangeably. 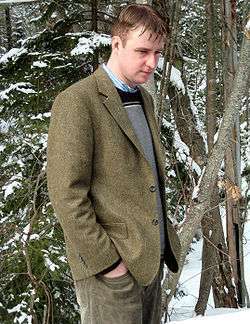 Blazer, similar to but more casual than a suit jacket; single- or double-breasted of sturdy material, commonly with metal buttons. Blouson, a military-style waist length jacket. Bomber jacket, a blouson originally designed for US aircrews in leather or nylon. Brunswick, a two-piece woman's gown of the mid-eighteenth century. Caraco, a woman's jacket of the 18th century. Dinner jacket, part of the black-tie dress code of evening formal wear. Also known as a Dinner suit and a Tuxedo. Field jacket, a jacket that is worn by soldiers on the battlefield or doing duties in cold weather. The field jacket came about during World War II with the US Army introducing the M-1941 and the M-1943 field jacket and issued the jacket to their troops. The most well-known and the most popular type of military field jacket that is on the market today is the M-1965 or M-65 field jacket which came into US military service in 1965. Gilet, a sleeveless jacket or vest. Wamus, also called a "roundabout," a traditional American term for a short jacket. 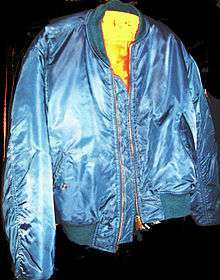 Wikimedia Commons has media related to Jackets. ↑ Picken, Mary Brooks (1999) . A Dictionary of Costume and Fashion. Dover Publications. p. 185. ISBN 978-0-486-40294-9. ↑ Harper, Douglas. "jacket". Online Etymology Dictionary. Retrieved 2011-09-07.